Check out the great look I recently got for some of Emir and I's wedding photos. 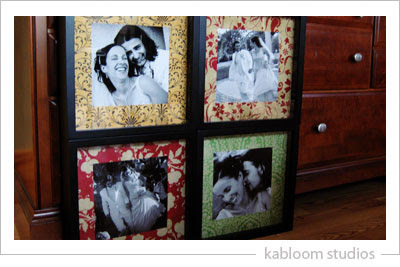 I went to Hobby Lobby a few weeks ago and bought 4- 12x12 shadow box frames (50% off!!!). Then I ordered some 12x12 prints featuring a favorite photo (with groovy background) and pinned it inside the shadowbox (pins are even included! ).